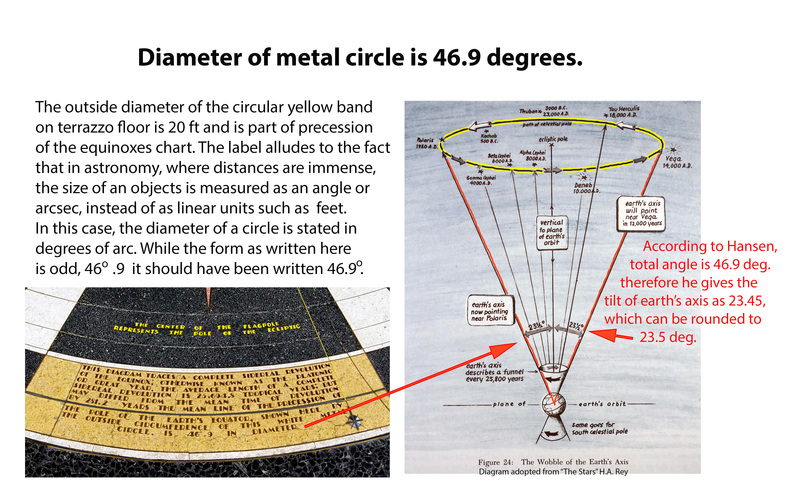 The Hoover Dam hides an intriguing secret connecting sky to ground and past to present, using very much the same “as above, so below” system of measuring time deployed at Giza around the Great Pyramid of Egypt. To learn more, take a read of this intriguing article by Wally Motloch. 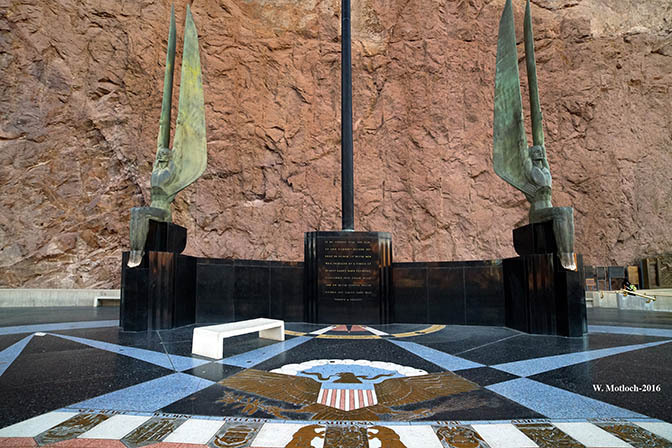 Located on the Nevada side of the Hoover Dam is an awesome monument dedicated to over 100 workers who lost their lives to the construction of the huge machine known as the Hoover Dam and Power Plant. Visitors are impressed by the two huge sculptures and the beauty of the base with inscriptions, but only few will notice that the monument sits atop a floor designed to look like a celestial map. 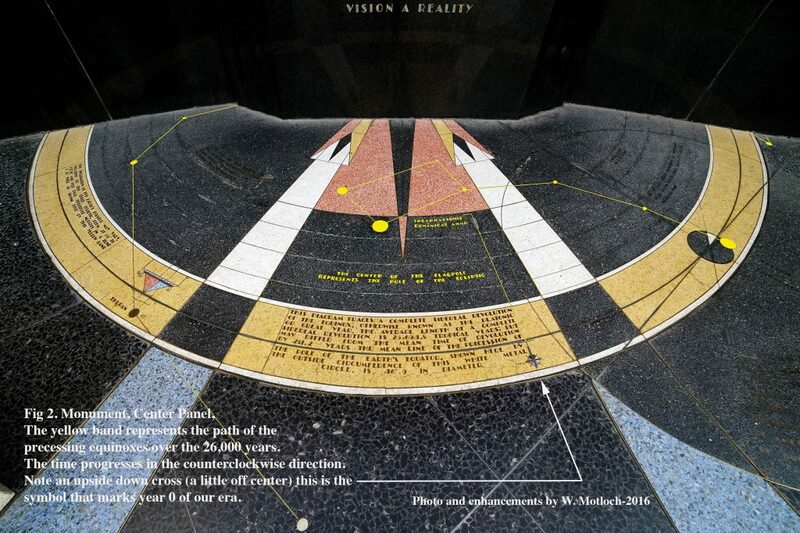 This celestial map is embedded in terrazzo floor around the monument. It is a beautifully executed representation of the night sky for a specific day and time and it includes many decorative features, astronomical markings and curious labels. 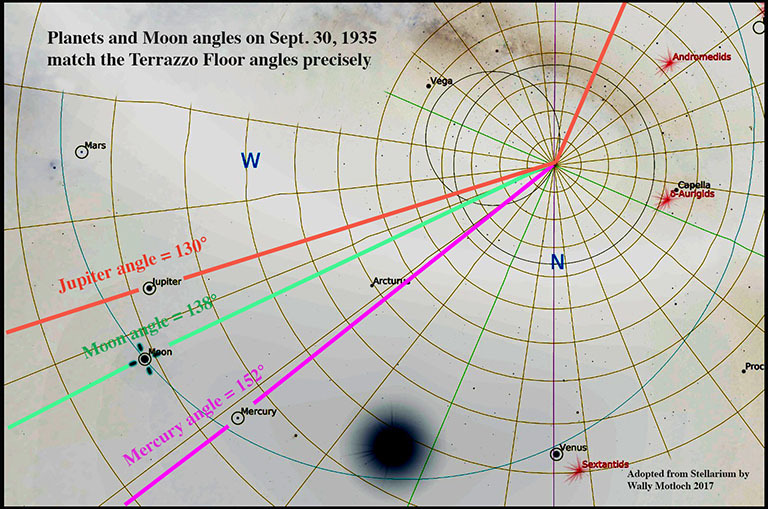 Back in 1930s, when this floor was designed, only an astronomer could have made sense of this information; but today, thanks to computers and applications like Stellarium, this knowledge is available to the average person who desires and determines to learn. Aligning structures to constellations or cardinal points was common in the past. Hancock readers see that the Egyptian pyramids are good examples of this. 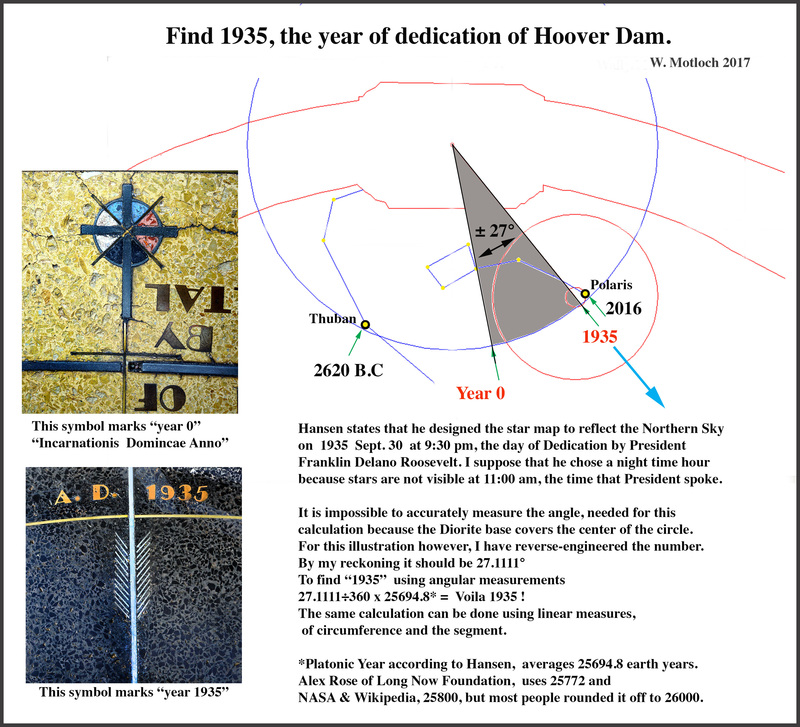 What is unique about the Hoover Dam sky map is the beauty of the design and precision employed by its creator, Oskar J.W. Hansen. I must preface this discussion by mentioning that I am not an astronomer. I invite the ideas and/or corrections of others to enrich this exploration. 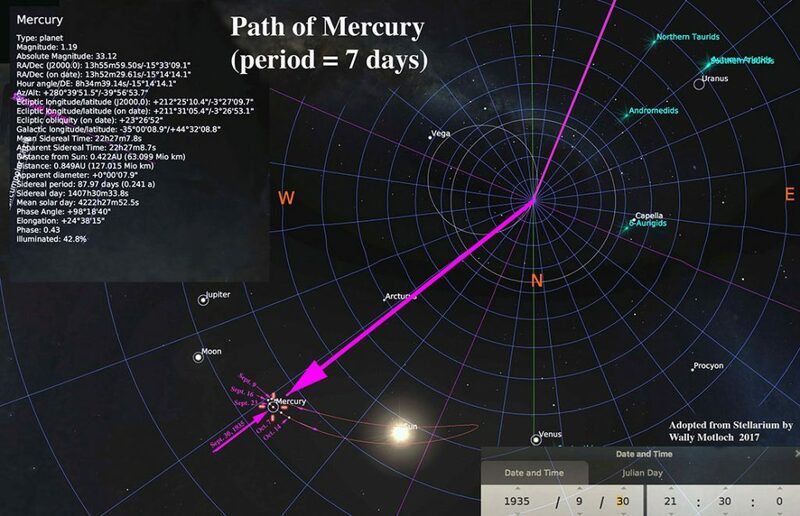 3) Download a free open source app called Stellarium. Also see instructions at the end of this article for setting up Stellarium. For those unfamiliar with the precession of the equinoxes, the phenomenon results from the “wobble” of the Earth’s axis, due mainly to the mass of the Moon (see Fig. 5). 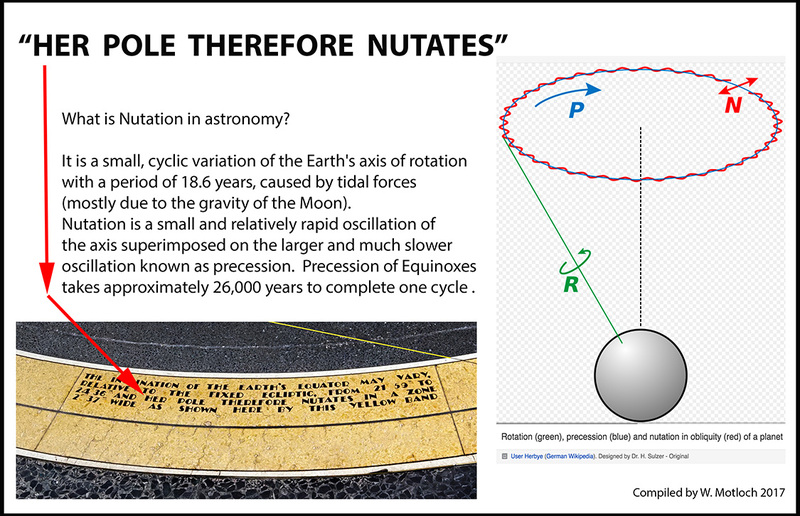 The inclination of axis of rotation to our sun (ecliptic plane) as well as the wobble and nutation affects the Earth. An observer on the surface of the spinning Earth looking east at sunrise would see different stars rising at different times, the result being that over 25,920 years, the entire circle of the 12 constellations of the Zodiac will successively appear on the horizon at very predictable intervals. Approximately every 2,150 years (25,920 /12), a new constellation will rise. The second place to look is north, to see the Pole Star, a different face on our clock. Were we to attach a powerful laser to the axis of the Earth’s rotation, it would trace a giant circle on the celestial sphere. Stars which are on or near this circle successively become “pole stars” over a period of approximately 26,000 years. Currently, in the Northern Hemisphere, Polaris is the north star, but in 12,000 years, the axis will point to Vega. As you can see, we have two ways to read time on our giant clock of 26,000 years. One way is to look NORTH at the circumpolar region to see which star the Pole Star is; or, we can look EAST during sunrise on the spring equinox to see which constellation is rising. One complete axial rotation of Earth’s axis is called a Platonic Year. This very slow movement of constellations and pole stars has been measured by astronomers as being 1° arc for every 72 years. Therefore, 1 Platonic Year equals 360° x 72 years, or 25,920 years. This very slow progression of 1° in 72 years has been immortalised in ancient lore, legends and literature. We see references to celestial numbers like 72, 108 (72 plus half of 72), and 43,200 (which is number of seconds in 12 hours: 12x 60x 60) and ratios, fractions and multiples of these numbers repeated in ancient literature, architecture, the Bible and myths from all over the world. We see 72 co-conspirators against Osiris in the drama of Osiris, Isis and Set; in Exodus 14:19-21, each of the three verses consists of 72 Hebrew letters; the Catholic Bible is made up of 72 books; and the designers of the Great pyramid used the ratio of 1/43,200 for the perimeter of the base to the Earth’s circumference at the equator. Various past cultures were able to measure these celestial motions, but only to the accuracy of whole numbers like 72. Also, we now know that orbits are ovular and each planet’s mass and gravity speeds up or down, so the Earth’s wobble changes from year to year. As the number “72 years” becomes 71.6 or 71.0008887 etc. we must adjust the length of the Platonic Year to keep up with cosmos. Given the aid of modern telescopes in outer space, very precise atomic clocks and the precision of computers, we see that planetary motions are not that consistent and do change over time. The length of a Platonic Year will continue to vary because of the uneven orbital distances and gravity of the Moon and Planes. As our equipment and the skill of astronomers improve, we will fine-tune this number by adding digits after the decimal point. Today, astronomers use 25,782.34 Julian years to 1 Platonic Year. Let us return to our monument, to which Hansen devoted over five years of his life and see how he encoded the chronological information. 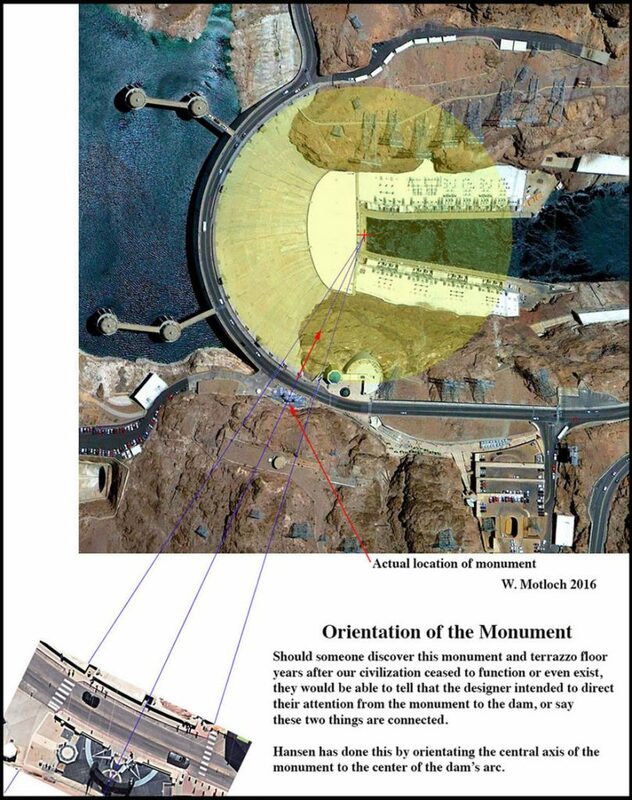 Below is an image of the overall view of the Monument Plaza previously known as the Safety Island. Fig.1 Front View of the Memorial Monument at Hoover Dam. Fig. 3 Monument, Left Panel. Fig. 4. Monument, Right Panel. Hansen says the total tilt of the Earth’s axis is 46.9° (23.45° to the north plus 23.45° to the south of the equator), but today, with better instruments and methods, astronomers have calculated it to be 23° 26’ 21.448” or 23. 441884° . Not only does the Earth’s axis wobble but it also vibrates (nutates); see the red line on the diagram and the yellow band on the floor. The terrazzo floor is mesmerisingly detailed, albeit puzzling. Hansen was not a trained astronomer but an artist, as well as a sailor and world traveler, who could navigate by the stars. 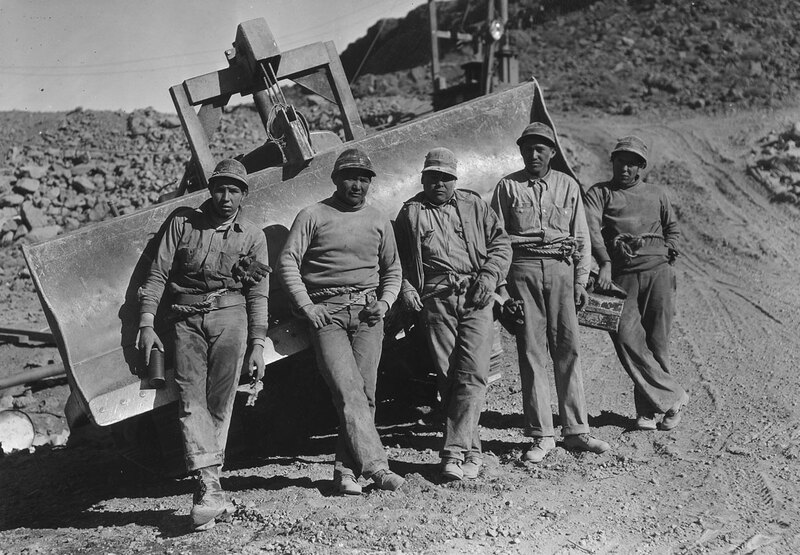 In the early 1900s, Hansen circumnavigated the Earth and spent time in Egypt. This explains his multiple referencing of Egypt and the night sky in the terrazzo floor. “Man’s control over natural forces has grown in proportion to his increasing knowledge of the true nature of the Universe of which we are a part…Time, the intangible governor of all our acts, is measured to us by the external relations of our Earth to other worlds. Therefore, I thought it fitting to have the base of the monument rise from a finely wrought, marble terrazzo star map of the northern regions of the sky. 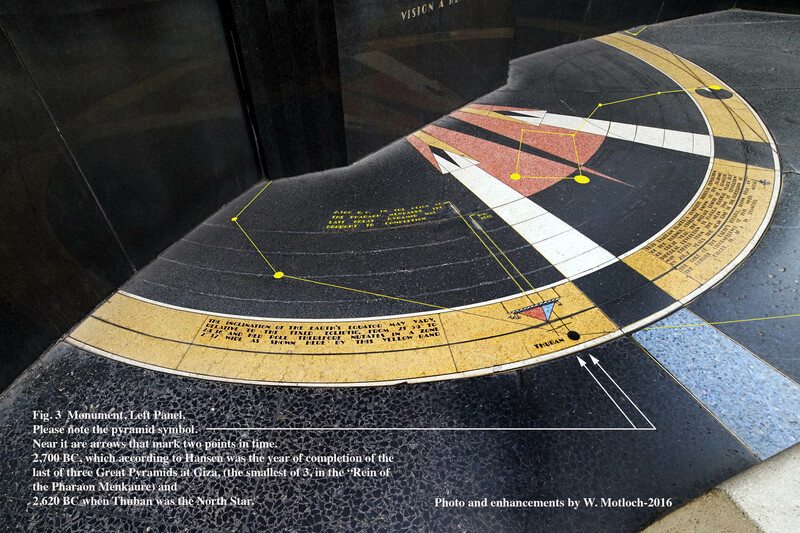 “The designer of the star chart…placed the bodies of our solar system in the terrazzo, correct to the minutest fraction of an inch in scale of the design. One versed in the abstruse mathematics of astronomy may calculate the precession of the Pole Star for the next 14,000 years by studying the design of the star chart. Conversely, future generations may look upon this monument and determine – if no other means are available – the exact date on which engineers and craftsmen of our generation completed this giant structure”. We know the date of this event was September 30, 1935. It is likely that Hansen chose the time of 21:30 for the time of dedication because the stars are not visible at 11:00 AM when the President spoke. Let’s see if we can locate this information in the architectural design of the monument. Fig. 7.Orientation of Monument indicates direction and connection to a place, in this case it is the dam. 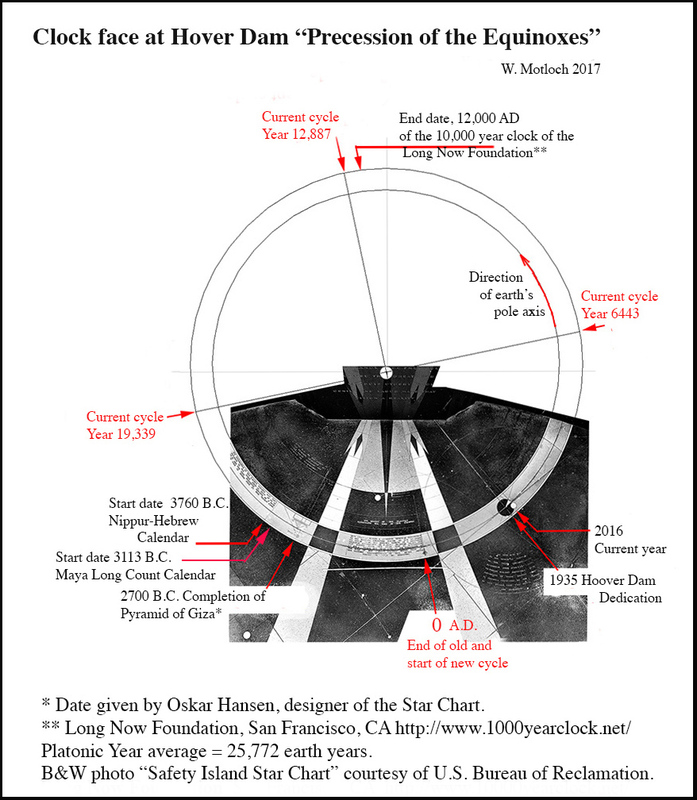 Hansen used the precession of the equinoxes circle as a clock face, or a time diagram (Fig. 8); the arrow pointing to a spot on the yellow rim labelled “A.D. 1935” marks the starting point of our era (year 0) and year 1935, (Fig. 9) indicating how much time has elapsed on the 26,000 year clock. Fig. 8. Find 1935 By angular calculations. Fig. 9. Top view of the Precession of the Equinoxes Circle. Markings on the outside of the circle show events from the past and future as these would appear on a diagram with a 26,000 year scale. The lower part is a black and white photo of the floor, supplied by the U.S. Department of Reclamation. Considering it takes 28 days for the Moon to orbit the Earth, 88 days for Mercury to orbit the Sun, and 4,330.6 days for Jupiter to orbit the Sun, the location of the Moon in the sky would be a good indicator for the days of the month. Jupiter and Mercury would indicate which month of the year is involved. 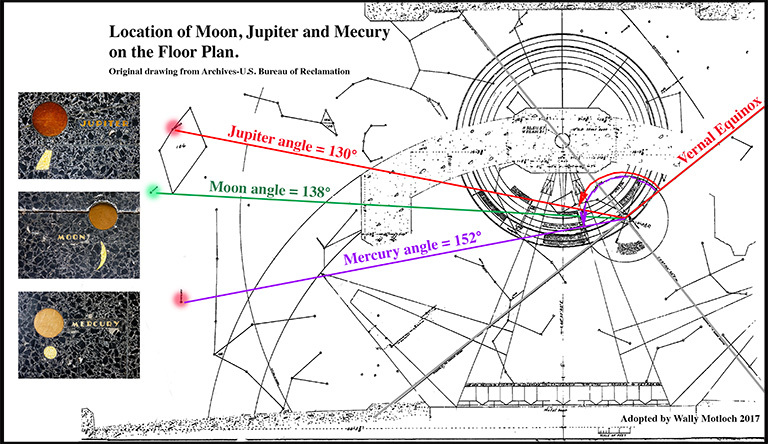 The orbit of the planets Mercury and Jupiter point to the month of September and the orbit of the Moon points to day 30 (see Figs 10,11,12,13 and 14). The star map is very detailed and precise. 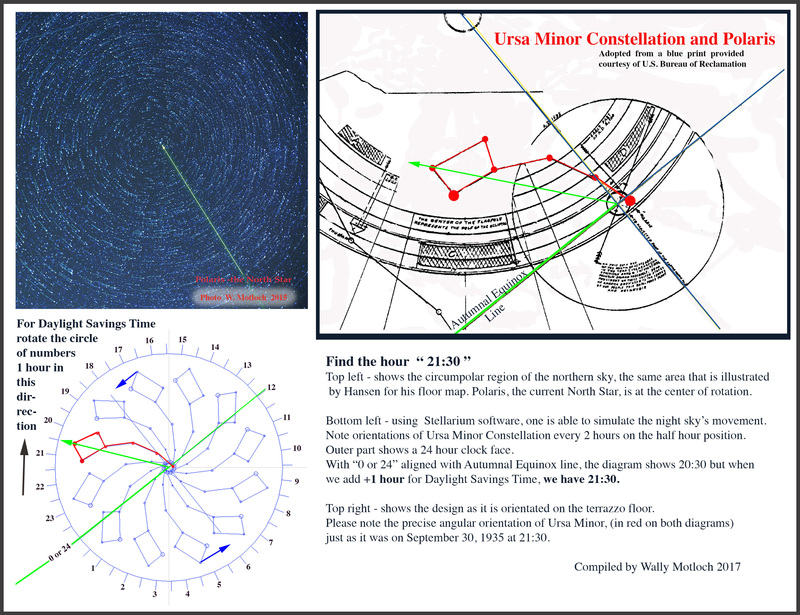 When we compare the image of the sky from Stellarium with that of the draftsman, and the floor, the angles are correct. One can see plainly that the Moon, Mercury and Jupiter are perfectly aligned to September 30 in the year of 1935: the proof is in the floor. Fig. 10. Location of the Moon, Jupiter and Mercury on the floor. Here you can see the floor plan and photos of each symbol. Photos of floor images are placed beside each celestial body as they are on the floor plan. Note my colored lines to each planet and the Moon. Compare the angle of each body with the vernal equinox line on the floor to that of the computer screen (Fig. 11). Fig.12. Path of Moon 1935, September 30. Note that the position of the Moon on the floor ONLY fits the date of September 30th as shown here. 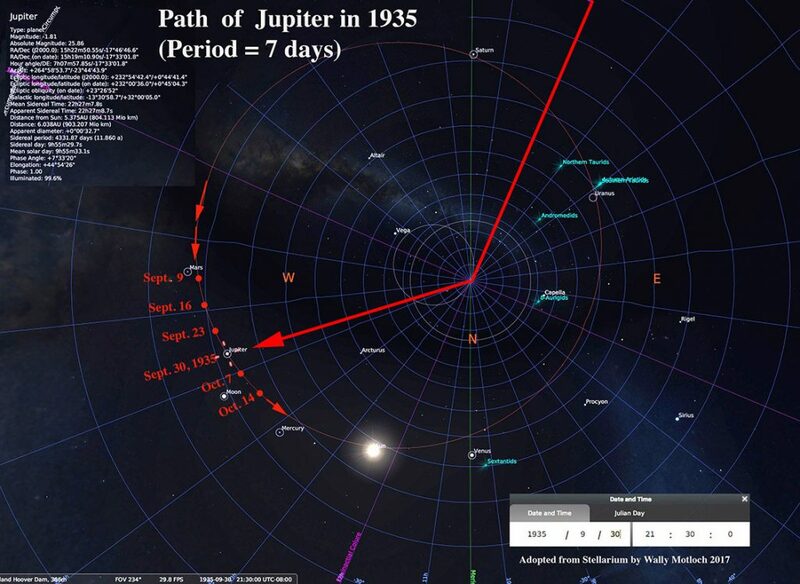 Note that the position of Jupiter on the floor also ONLY fits the date of September 30th. Note that the position of Mercury on the floor ONLY fits the date of September 30 on this chart. Since the Earth spins on its axis every 24 hours, all we have to do is look at the circumpolar region of the sky in Stellarium, to see how wonderfully the stars seem to spin around Polaris. Compare this with the design on the floor and you’ll see that the match is astonishingly accurate. The Ursa Minor constellation with Polaris is positioned exactly where it needs to be to indicate the right time. Start with a 24 hour clock, align the 0 hour to the autumnal equinox line and your clock will read 20:30. Add 1 hour for Daylight Saving Time. And the stars are shown at 21:30 just as they should be! Oskar Hansen was a genius! Hansen, Oskar J.W. Beyond The Cherubim, Vintage Press. Hancock, Graham. Fingerprints of the Gods, Crown Publications. Rey, H.A. The Stars. Houghton Mifflin Co.
James B. The Ever-Changing Sky, A Guide to the Celestial Sphere, Cambridge University Press. Reingold & Nachum. Calendrical Calculations, The Millennium Edition Cambridge Press. Friedman, Robert. The Astronomer’s Universe: Stars, Galaxies and Cosmos, W.W. Norton & Co.
Berman, Bob. Secrets of the Night Sky. The Most Amazing Things in the Universe you can see with the Naked Eye, HarperPerennial Publishers. Mayall & Wyckoff. A Handbook for Amateur Astronomers, Golden Books. Rose, Alexander. Safety Island, April 2013. How to set up Stellarium for viewing the night sky at Hoover Dam as it was on September 30, 1935 at 21:30. Stop the clock so the sky stops rotating. City, (I call mine “Safety Island Hoover Dam” and set it as a default location). In View- go to Markings, Select- Precession Circles, Meridian, Colures, and Steriographic View. N.B. Keep verifying your settings because the program has the nasty habit of changing them while you’re not looking! 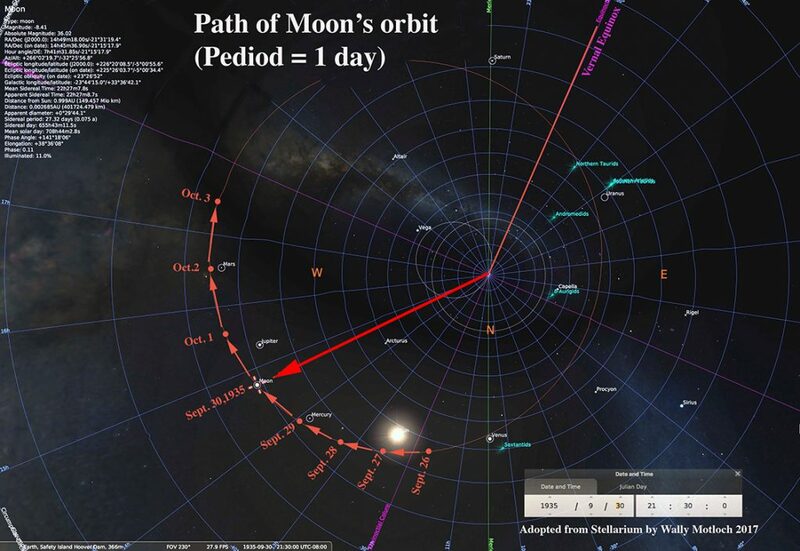 http://sites.google.com/site/earthgyration/ (with various relevant sub-links) places the significance of true Polar wander & celestial alignments in context. Therefore, what would be helpful also, if they are recorded at the Hoover Dam, are the Solstice alignments. Thank you, Wally Matloch, for your presentation and revisiting that astronomical marker [Hoover Dam] while giving me some ideas about this malleable planet we seem to be moving around on . . . Fascinating! . .Doesn’t come close. It occurs to me that the stones of Callanish, Scotland, might be datable, albeit, retro-datable, in a similar manner, for when those stones of Callanish were initially positioned in the distant past using the methods at Hoover Dam, if some folks haven’t already. There is some mention of a distant date of 2900 BC or so for Callanish, but there isn’t clarity whether the Stones of Callanish were also astronomically positioned at that time. The lunar wobble, Nutation (approximate 18.6 year), or rapid oscillation of the Earth’s axial motion within the approximate 26,000 year precessional wobble seems to have been incorporated into the Callanish Stone positions, too. Some folks believe Callanish much older and that it was under a different language and name before the Romans are believed to have sailed there and added their influence. Given the useful data incorporated into the Hoover Dam Monument serves much more than just a dedication date by then President Roosevelt, in my opinion. 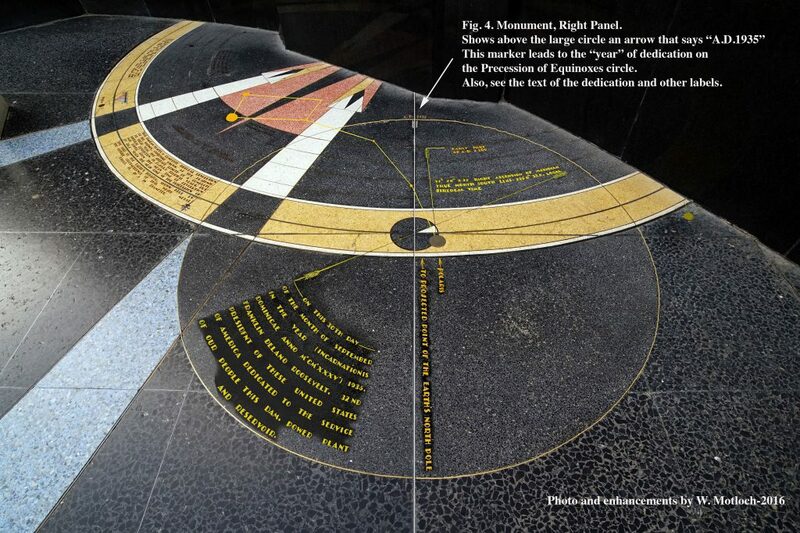 There’s plenty to extrapolate from the celestial map embedded into and onto the terrazzo floor monument area. It might be a way of more precisely dating many other more recent discoveries (those very big worldly monuments, stones, constructions, above and below) that were not part of the general knowing populace back in 1935. Excellent review. Should the construction at Hoover Dam remain and still be a point of interest in the distant future, I suspect it will be something of an aid toward investigation much as the other megaliths and ancient constructs seem to be today – like the Pyramids, Stonehenge, Callanish, Teotihuacan, Yonaguni, Java, Machu Picchu, and many other sites in the Ukraine and Russia, to name a few. It is interesting… There was a show that said the Hoover Damn would remain one of the last manmade structures on earth after a civilization destroying nuclear event. That once the Hoover Damn went, the water would reclaim the southern state of California. I found it very interesting to read that it also features a star map. Nice find! He works with Alex Rose.